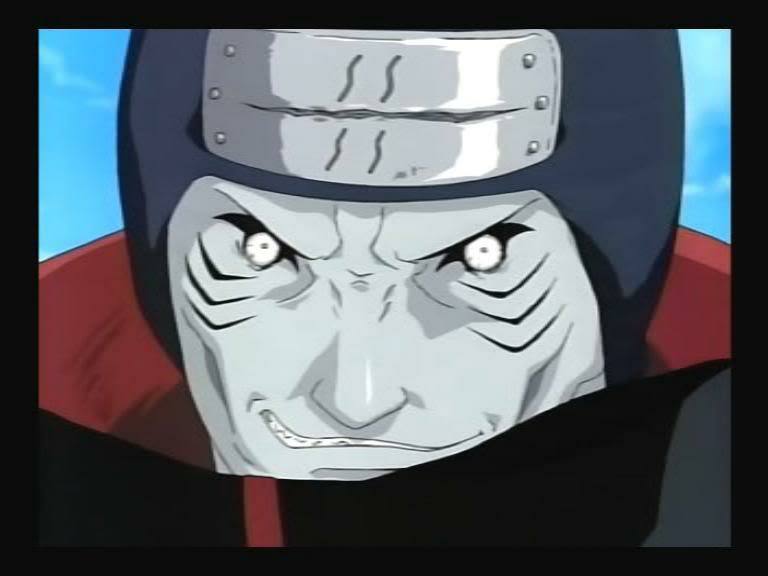 Personality: Kisame is an impatient fellow who likes to chop off the limbs of others and cut them up. He likes killing and his violent surge of temple could make him extremely powerful and vunerable. 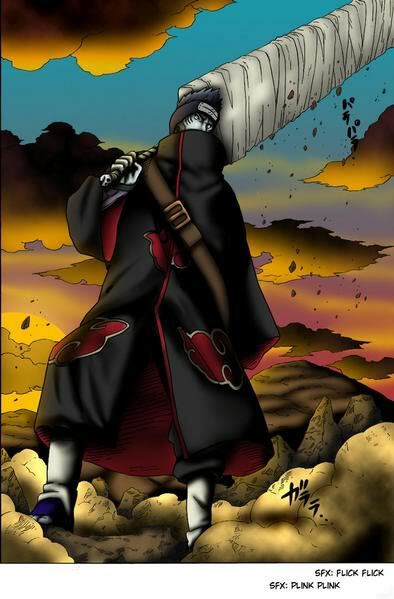 Kisame loves to shave off layers of people and murdering is his specailty, having multiple ways to do it. The sight of blood instantly activates Kisame's lust. He dosen't enjoy the ways of his Akatsuki partner Itachi Uchiha for patience. However, he sides by the Legendary Uchiha since he knows Itachi's power may be near enough to surpass his and decides not to make him angry. Kisame is extremely dangerous. Approaching him could be fatal. Rank: Missing Nin/Akatsuki Member, Former Jounin. Village: Former- Mist, now is wandering around the continent. Suiton • Baku Suishouha is a Ninjutsu technique utilizing the Water Element. After forming the needed handseals, Kisame will expel water from his gullet. This will then expand into a large volume of water. Being from the Water Country, Kisame is at home with this type of jutsu. He can control the water by riding on top of the waves. A highly dangerous S-Ranked criminal, Kisame was an elite Jounin in Hidden Mist Village until he began to assassinate the local Mist feudal lords. Fleeing his village, Kisame then joined the Akatsuki Organization. Kisame was ordered by the leader of Akatsuki to partner with Uchiha Itachi and obtain the Kyuubi demon from within Naruto. The two S-Ranked criminals went to Leaf Village in search of Naruto. Sarutobi Asuma and Yuuhi Kurenai confronted the two, so the ninja began to battle. Kisame used his head-cleaver against Asuma and managed to surprise the Leaf Jounin with its shark skin scales. Kisame drew blood but Asuma was able to recover himself. When Maito Gai appeared, Itachi and Kisame fled. Later Kisame and Itachi tracked Naruto down to a hotel outside of Leaf Village. They were about to capture Naruto when Sasuke and Jiraiya appeared. Seeing that it was not the right moment, the two Akatsuki members fled. Over the next few years, Kisame and Akatsuki would wait patiently to capture more demon vessels like Naruto. When Akatsuki members Sasori and Deidara returned from Hidden Sand with the captured Gaara in tow, Itachi and Kisame were directed to delay the pursuing Leaf and Sand ninja. Kisame was eager to get a measure of revenge again Maito Gai who had gave him a hard kick years earlier. Kisame managed to capture Gai's former students in a water prison, allowing himself and Gai to duke it out one on one. Gai was forced to open his gates to avoid Kisame's water attacks. Gai pummeled Kisame and knocked him back to the earth. Gai then learned that the Kisame he fought was not really Kisame himself, but another who was sacrificed to become Kisame in appearance while Kisame himself could fight through him from afar. The delay plan worked, and Kisame and Itachi were able to give Akatsuki enough time to remove Shukaku from Gaara. Kisame is a former member of the Seven Sowrdsmen of the Mist. Like Zabuza and Raiga, they all despise each other members and their inferior abilities as they think. His sword is the one named Sameheda or Shark Skin and when used, a few people could get near him to touch him. After sabotage on towns and assasination of the fuedal lords, Kisame also sides by madara Uchiha, who at that time is the Mizukage. Deceased. Oh, and remember to lock topics when they're approved.